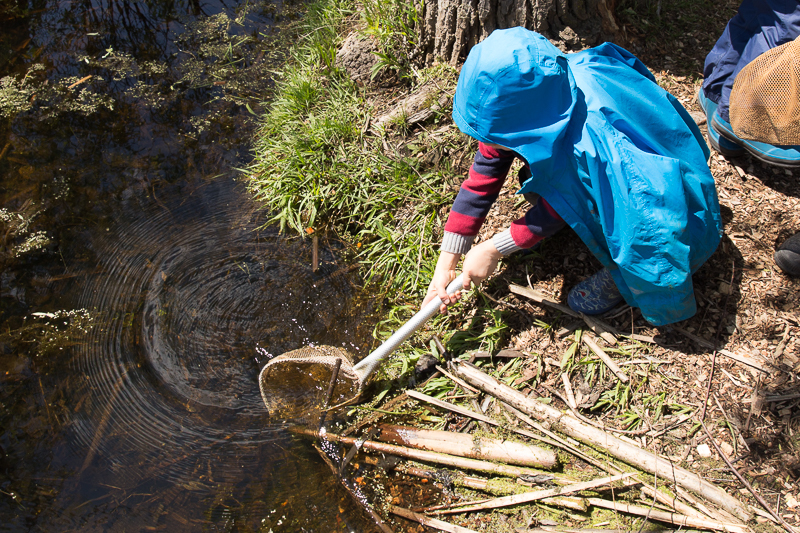 The Forest Kindergarten is a magical place where your child’s imagination is nurtured and exploring the natural world is something students do every day. Imagine a kindergarten class which begins each day with a hike; visiting the forest, the meadow, the pond or the school garden. Witnessing weather cycles, seasonal changes, animal habitats and how vegetables grow rather than simply hearing about them. Imagine a kindergarten which honors the deep authentic learning which occurs naturally through unstructured free play, both outdoors and in and provides adequate time for both. Offering opportunities to climb trees, dig in the mud, build forts, roll down hills and create elaborate imaginary worlds. A kindergarten whose outdoor play spaces do not include monkey bars, slides or balls, but instead offers a dense clutch of trees in “Forest Kingdom”, a lush green space to run in the “Galloping Meadow” and a babbling brook just right for testing handmade boats. Imagine a kindergarten class in which mathematics lessons may include noting a pattern on a found feather, grouping and regrouping pinecones to add and subtract and calculating distances between favorite trees using boot prints rather than using worksheets. Imagine a kindergarten classroom with beautiful natural light and open space, and shelves which are not filled with prepackaged educational materials and supplies, but rather collected objects and tools created by the children, for the children. A classroom showcasing children’s artistic endeavors as well as functional creations such as handmade paper, handmade paint brushes and tree blocks gathered, cut and sanded by the children. Imagine a kindergarten classroom where music, art, foreign language, movement and creative expression are part of the day’s rhythm, not just a once a week specialty. A place where rich, diverse stories are plentiful, both through oral storytelling and a carefully curated classroom library. Imagine a kindergartener who has a voice, a choice and a place. Imagine a kindergartener free to just be.